The stove is gorgeous. I don’t have a designer kitchen. Just a regular kitchen. This stove fits right in and it’s beautiful. I know this sounds geeky but I read the whole manual before I turned it on. My husband, Mark, decided to put in his two cents. Mark: What are you doing? Me: I’m reading the manual. Mark: What do you need to read? Just turn it on. Me: I just want to make sure I’m doing it right. Okay, so he was right. I wish I could say that I made something super exotic for dinner. I made stuffing, roasted golden beets and carrots and a pork tenderloin. The stove worked perfectly. I can’t believe how responsive gas is. It’s probably my imagination, but I think our dinner tasted better on the new stove. I’m a little concerned about the effort involved in keeping it clean, but I’m not the type who cares if the stove looks like it’s being used. It doesn’t have to look showroom perfect. It’s been six years. There are a few scratches and a little browning around the burners but all, in all, she’s still looking pretty good to me! I use both ovens regularly and the same goes for all five burners. I couldn’t be happier with the stove and I am really pleased that we installed the hood. I don’t have to worry about a smoke- filled house anymore! As for cleaning, I use soap, water and soft cloths to buff dry. For the hood I use Weiman Stainless Steel cleaner. I’m still not sure how to remove the brown around the burners. Let me know if you have any ideas that could help. Somehow having this pretty workhorse in my kitchen makes me feel like my idol Ina Garten, The Barefoot Contessa. Shoot, just call me The Barefoot Kimtessa ’cause this stove makes me feel like a pro-fesh-o-nal EVERY TIME I use it. What’s the last appliance you updated? And do you love it? Let me know! Also which do you prefer – gas or electric? Or doesn’t it matter? Janice – Good point! We lose our power a lot. Now I can cook inside instead of outside on the grill, which is especially hard to do when there’s snow outside! I prefer whatever your making me dinner on! 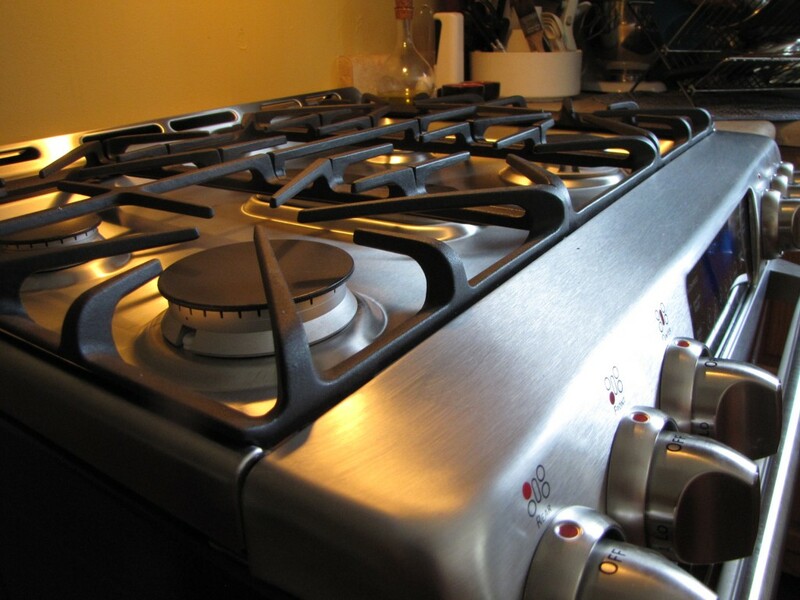 I’ve always preferred gas to electric–it seems to have better control of heat and more consistent. 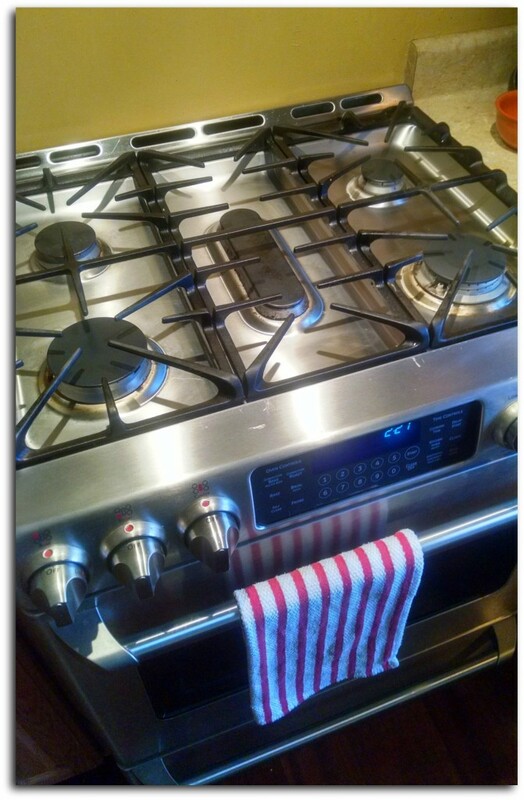 The other benefit to remember–you can still use the cooktop even without power. everything Janice said. Gas is the best -in stoves anyway. you oughta go pro now. – oh and I love your & Mark’s convo about the manual and what he said. I’m Mark, Charlie is you. Mark and I rule! I am soooo jealous! I want to renovate my kitchen in the worse way. I agree with Janice, I feel the same way about my gas stove, I never did like electric stove tops. The time that our electric went out for 15+ hours, I was still able to cook on my gas stove. Good luck with it!! If you can cook you can cook. So gas or electric Does’nt matter to me. An I do 90% of the cooking. I had a glass electric stove before. It was great. I do agree with you. If you can cook, you can cook. BUT I will say that gas is way more responsive. 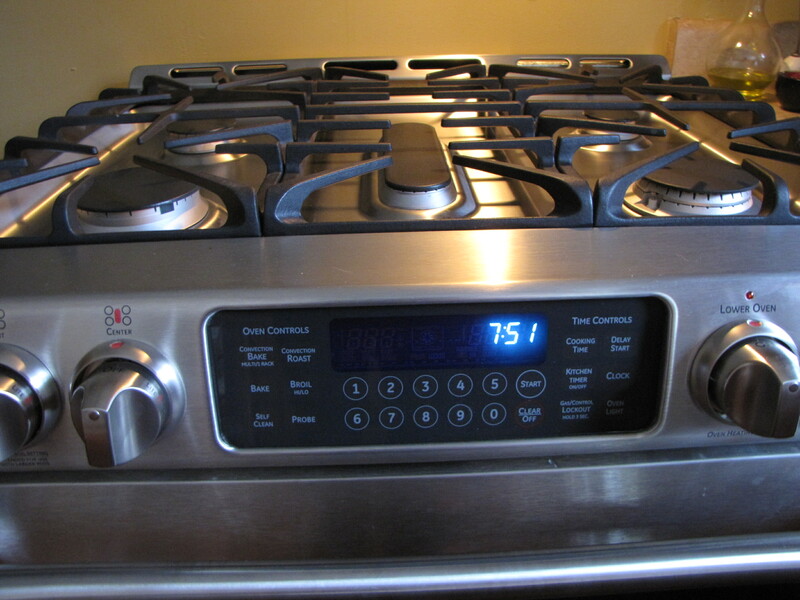 I can get the heat very low, which I couldn’t with my electric, and I love having that fifth burner with the griddle. I love that you do 90% of the cooking. Rock on! 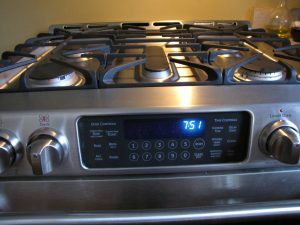 My sister knows a chef and he said to have the best of both worlds – have a gas cooktop and an electric oven….NOW…Kim has it ALL! You rock girl! It doesn’t matter, but if I had an oven like that!? Very nice! Oh I am so jealous. I also agree with Rebecca. Just so long as your doing the cooking you can use whatever you like! You’re right. If you can cook, you can cook. But I love the tool that I have in this stove. I like having 5 burners and the three racks in the oven are awesome!